Announcement Healing guidance + inspiration for your whole being + free worldwide shipping on everything! Healing guidance + inspiration for your whole being + free worldwide shipping on everything! Kathy put her heart and soul in this deck, as well as its accompanying book. So they will take good care of you. I don’t say that lightly. I’ve been a professional psychic for over three decades, have created a divination system myself, and strive toward the highest standards in my work, so I recommend someone else’s work only if it’s wonderful. Incredibly fascinating. Thank you so much for the immediate attention given to my request to learn more about my birth date!! This seller rocks. Fun deck. Great communication. Would definitely recommend. Timely delivery, too. Thank you! I live in sunny Temecula, Southern California with my two dogs and architect husband in an adobe style home we built ourselves. 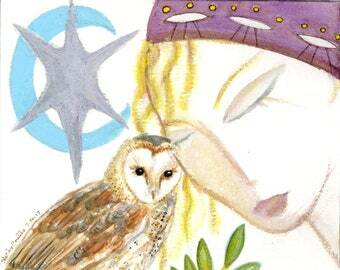 My work and life are inspired by my shamanic practice, daily painting, and country living. My first passion has always been astrology but I wanted to deepen my intuitive practice so I became a Soul Reader after intensive training within an English Traditional Healing Circle and spending 5 years drawing with my non dominant left hand after turning 40 in 2005. This awakened my intuitive brain and forced me to share my gifts with others so I started giving Soul Readings online and things really took off! I turned my ‘lefty’ drawings into a Lefty Oracle Deck and use them in my readings and also in my Moon Circles. People really resonated with the Leftys in a very heartfelt, inner child kind of way that helped them see things in new ways. 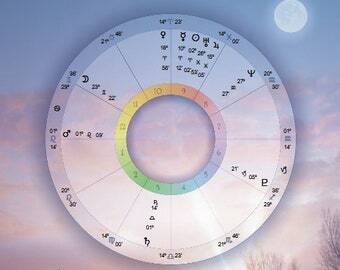 In the ‘90’s I wrote a book channeling all twelve zodiac signs over one month as the Moon cycled through each sign. I researched Goddesses instead of Gods because female energy was not well represented in the astrology world. To do this I wrote and painted Goddesses in tune with the zodiac sign of the moon to express all that I felt, heard, saw. In 2008 I was invited by another hero of mine; an activist and singer by the name of Michelle Shocked to bring my Leftys onstage to her Women’s Day Campfire event in Hollywood. I was terrified but could not refuse of course! As I stood up there and talked very briefly about the Leftys Michelle played my favorite song in the background, When I grow up I want to be an Old Woman which I like to call their 15 minutes of fame. Since then I’ve spent much time alone (hermiting), painting, drawing, creating, meditating, but I keep coming back to the Leftys and what they taught me: we are none of us perfect, but we’re doing the best we can. In 2010 I was invited by my hero in the healing world, herbalist Susun Weed to create a class for her newly formed Wise Woman University so I created a 4 week online course that would provide women with all the basics for starting and committing to a moon guided journey into their Divine Feminine Soul. This class inspired me to create live New Moon Circles to help myself and others to connect spiritually and set intentions at the New Moon. I have studied with Adam Higgs (psychic mediumship), Om, devotee of Sri Chinmoy (meditation), Atma Khalsa (yoga), Susun Weed (herbalism), Joyce Fournier, RN (Therapeutic Touch), Steven Forrest & Jeffrey Wolf Green (astrology). I received certification in crystal healing from Katrina Raphaell’s Crystal Academy and was initiated as a Celtic Faerie Shaman in the Third Road Tradition by Francesca De Grandis in 2017. I am currently working on my second oracle card deck, The Elfin Ally Oracle which will be released in the Spring of 2019. It all began one summer at my cottage in Ontario, Canada...inspired by the trees and the forest and the wild otter playing in the river at dusk. Kathy empowers soul-seekers to live the life of their dreams through oracle decks, astrology, classes, inspirational art, ebooks, and other online resources. Gamecrafter is the printer/manufacturer of my deck. This deck is printed in China. Hi and welcome to my shop! 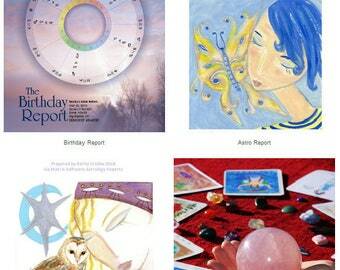 I have been a professional artist and astrologer since 1992 and have been offering my services on Etsy since 2008. I stand by my work 100% so if you're not completely satisfied please let me know so we can both be completely happy. I understand that in making an appointment with Kathy Crabbe that I am paying for her time. I understand that there is no guarantee of the accuracy rate for a consultation and that all predictive information should be used for entertainment purposes only. Kathy Crabbe is not a health care professional; she does not diagnose, or claim to heal emotional or physical ailments and disorders. I understand that there will be no refund after the service of a consultation has been given. It is also understood that by booking a consultation that you are agreeing to the above terms. Payment is gladly accepted through the secured online service of paypal even if you do not have a paypal account. I also accept all credit cards, checks and money orders. Orders are shipped USPS first class. International orders will be shipped Airmail. If none of these things works for you please email me and we can work out some special arrangements.